QHYCCD CFW3L filter wheel, for 7 filters 50,8mm diameter, motorized and with USB connection to computer. If you are using a monochrome camera for astrophotography, in order to record color images you will need to use filters like the LRGB Sets or narrow-band filters such as H-alpha, O -III or S-II. For this application it's very useful to use a motorized filter wheel, controlled directly by the computer: controlled by an appropriate software, the QHYCCD CFW3L motorized filter wheel can move precisely and quickly the filters in front of your camera without introducing vibrations. 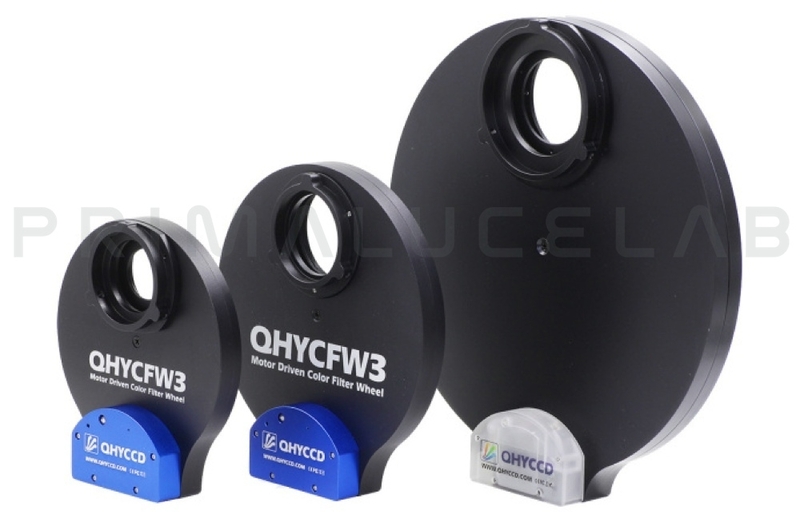 QHYCFW3L is the third generation of QHYCCD motorized filter wheels that improved both the mechanical and electric design. It uses a new high quality ultra-thin hybrid stepper motor. Compared to the normal stepper motor used in many filter wheels, the hybrid stepper motor has higher precision and smaller step angle. The motor is enclosed to prevent dust from entering the motor, thus improving reliability and motor life. The direction of filter rotation can be reversed: the filter carousel can be rotated clockwise or counterclockwise to complete the rotation quickly which is very convenient. QHYCCD offers a complete line of motorized filter wheels, as you can see in the table below. Note: CFW3S and CFW3M are available also in "Thin" body model that allow you to insert filters up to 5mm in thickness. Please contact us if you're interested in this option. A big step ahead from the Cfw2, each detail that was poor is refined. No flaws, M54 threads on both side (you have to remove the pull in adapter), can adapt to any camera.